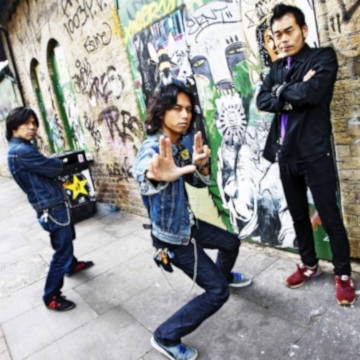 Electric Eel Shock left their native Japan in 1999 to see what they could make of America and they have been on a near constant world tour ever since. EES paid their way by selling merchandise and their self recorded album “Slayers Bay Blues” at their gigs. Headlining a stage at the prestigious Roskilde Festival in Denmark was a key early event for the band. By 2004 EES had toured 27 countries around the world and they decided it was about time to release an album: “GO EUROPE!” became the first commercially available EES release and the band performed at 30 European Summer Festivals.